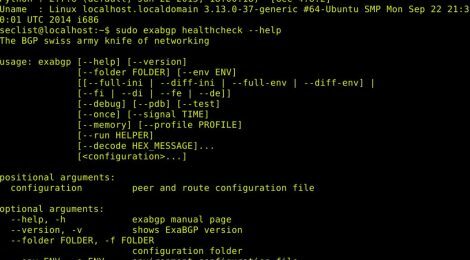 Browse: Home / exabgp v4.0.0 – The BGP swiss army knife of networking. 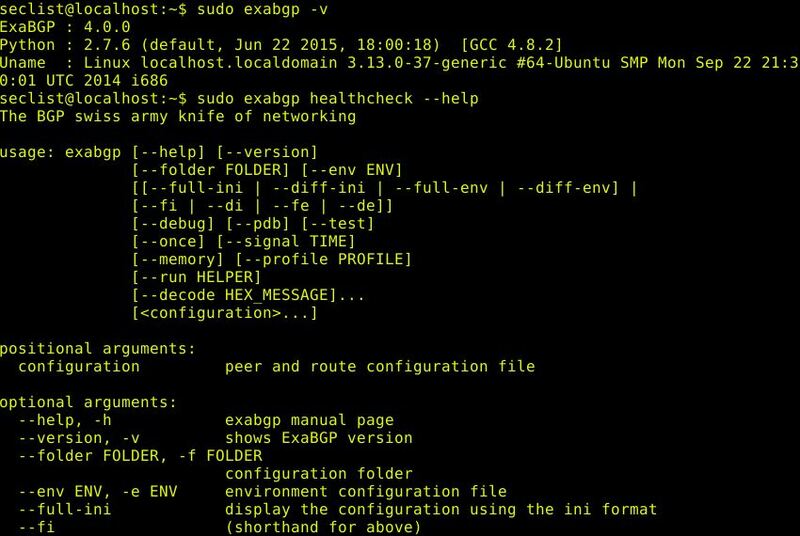 * Change: ExaBGP is now run as user/group exabgp/exabgp with the systemd service file. * Fix: the ttl-security parameter didn´t really work. Fixed for outgoing connections now. ExaBGP provides a convenient way to implement Software Defined Networking by transforming BGP messages into friendly plain text or JSON, which can then be easily handled by simple scripts or your BSS/OSS. It is routinely used to improve service resilience and provide protection against network or service failures. For example, thanks to the healthcheck backend included, anycasted DNS service failures can be detected and handled gracefully. To help you get started, Vincent Bernat put forward a full lab explaining how to best use this feature. Also, alone or in conjunction with fastnetmon, it provides network operators a cost effective DDOS protection solution. But it is not its only strength, thanks to modern routers’ flow balancing, ExaBGP can also be used to save you money on load balancers. Other uses include keeping an eye on network changes done by RIPE or by other networks with GIXLG. * ExaBGP does not perform any FIB manipulation. If this is what you need, you may consider another open source BGP daemon such as BIRD or Quagga. ← JMET – The Java Message Exploitation Tool.